Charging tax for the delivery fee (if applicable). Navigate to your Settings → General Settings page. Check off Accept Delivery Orders. Several more fields will be enabled. Delivery Fee: Set a cost to the customer for a delivery fee. Leaving this field blank will have delivery always free. Minimum Delivery Amount: Set a minimum for the order in to have it deliverable. Leaving this field blank will have no minimum for delivery. Free Delivery Amount: Set a minimum requirement for free delivery. 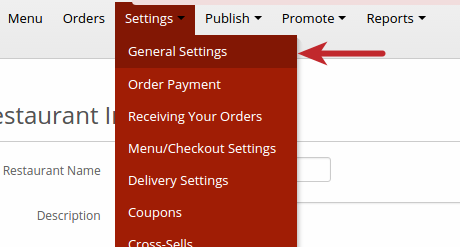 As noted on the Settings Page, having an amount above the inputted price will have the order set for free delivery. Once your desired changes have been made, ensure you scroll to the bottom and select "Save Settings". After doing so, a new navigation option will appear. This next section will cover setting up your location's delivery availability. Navigate to your Settings → Delivery Settings page. This section will allow you to configure your delivery areas based on location. Use Delivery Radius: Checking off this option will allow you to set the distance, in miles, from your location that you will deliver to. Setting a fee based on location. This is advantageous if you'd like to charge a little extra for some more travel. Setting additional time for the order fulfillment. This is advantageous if you'd like to allow a little extra time for an order to be completed because of the extra distance. Use Zip/Post Codes: Checking off this option will allow you to enter a series of zip codes (separated by commas) that you will deliver to. Enabling fees/time by zip code will drop a table that allows you to enter a fee, additional order time allotment, and a minimum amount. Tax Delivery Fee? : Checking off this option will charge tax to delivery fees (if applicable). Once making any changes to this page, ensure you choose Save Delivery Settings, and you're all set!